Aziz Ismail Ansari is an American actor, producer, writer, director and comedian from Columbia. Ansari is known for his role on the NBC ‘Park and Recreation’ and ‘Master of None’. He won several acting and writing awards for his performance in the series. He became the first Indian American and Asian actor to win a Golden Globe for acting in television. As of 2019, Aziz Ansari’s net worth is estimated to be $18 million dollars. Aziz Ismail Ansari was born in Columbia, South Carolina on the 23rd of February, 1983. Ansari grew up in Bennettsville where he attended Marlboro Academy, he later graduated from the New York University Stern School of Business with a major in marketing. Ansari’s mother is a gynecologist, and his father is a gastroenterologist. Both of his parents have appeared in two seasons of ‘Master of None’. Aziz Ansari’s career started in 2004 when he was given a role in the television series ‘Uncle Morty’s Dub Shack’. The show was followed by a minor role in the comedy film ‘School for Scoundrels’ and ‘flight of the Conchords’. Ansari later produced and starred in various roles of his own sketch comedy show ‘Human Giant’. He made a name for himself in the film industry and starred in movies such as ‘The Rocker, ‘Worst Week’, ‘Funny People’, ‘Observe and Report’, ‘I Love You, Man’. In 2009, he did multiple television shows with roles in ‘Reno 911’ and ‘Scrubs’. Apart from acting, Ansari has also given voice-over for the movie ‘The Life & Times of Tim’. Ansari’s big breakthrough came when he received the main role of Tom Haverford in the political comedy series ‘Park and Recreation’. His career touched heights when he wrote and starred in the comedy tour ‘Dangerously Delicious’ in 2012. The following year, he also received a short role in the Kanye West film ‘Cruel Summer’. His voice-over acting career continued with the sitcom ‘Bob’s Burgers for which he gave voice for seven episodes. Ansari also wrote and starred in the stand-up comedy movie ‘Aziz Ansari: Buried Alive’ and the movie ‘Epic’ which was filmed in Philadelphia. Ansari was given a small role in the movie ‘Date and Switch’. He began working with Alan Yang and created the comedy-drama series ‘Master of None in 2015. Since then, he has also hosted one of the episodes of ‘Saturday Night Live’ with rapper Big Sean. Aziz Ansari is known for collaborating with some of the best actors in the world such as Jonah Hill, Seth Rogen, and James Franco. There’s no doubt that his net worth will continue to increase in his future. He is best known for his performance in the NBC series ‘Parks and Recreation’. As of 2018, Aziz Ansari’s net worth is $18 million dollars. Ansari is he first Indian American and Asian actor to win a Golden Globe for acting in television. 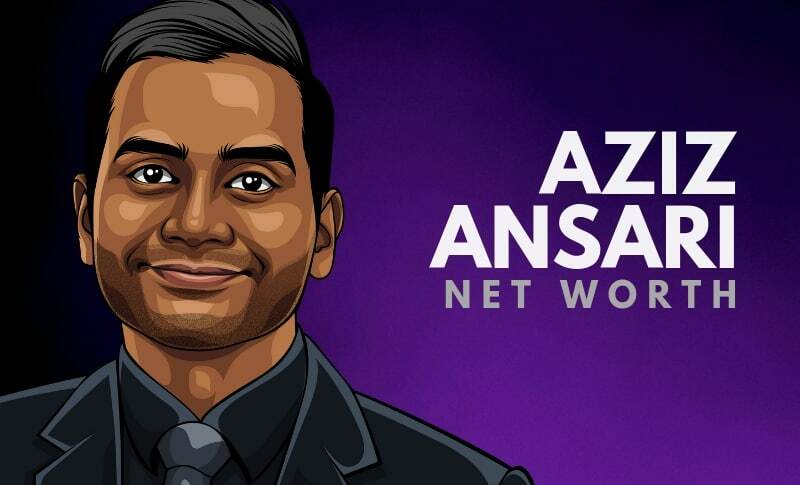 What do you think about Aziz Ansari’s net worth? Leave a comment below.